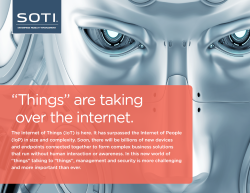 Download this white paper to learn the origins of the IoT, how to manage your company’s IoT, and how “things” will allow you to connect like never before. Mobile applications are becoming more and more important, especially after the Internet of Things disrupted not only enterprises, but the world. Industry experts agree that the IoT is going to grow exponentially over the next few years.